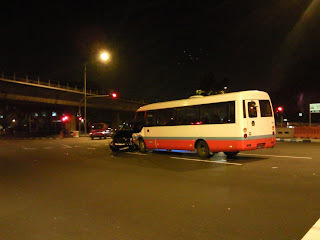 While cycling back home, saw these two vehicles already smashed into each other. 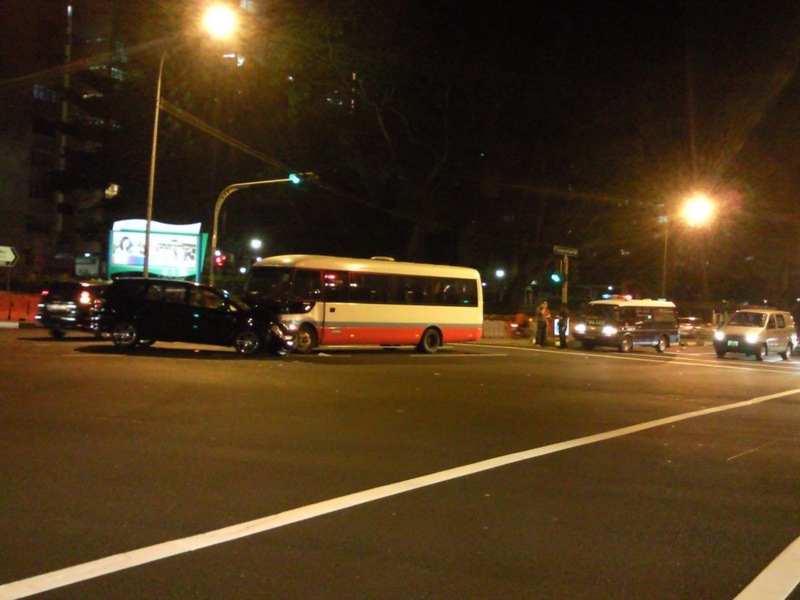 The front of the black SUV badly damaged ! 1 police van was behind assisting in the investigation. If one of them was a Motorbike user, we may be seeing anthr black car behind or a.k.a ' Orh Chia ' (for dead victims). I believed there's no casualties involved since no ambulance was called in. Wondering if its the black SUV fault for the Mini-Bus to notice it? 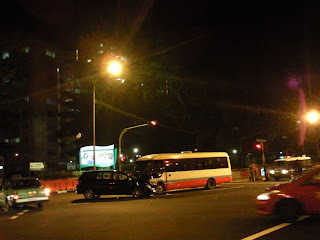 I think its the black SUV wanna to "cheong" in & end up smashing the Mini-Bus on standby mode while waiting to turn right into BoonLay Way to JurPoint. The front of the black SUV total wrecked up while the Mini-Bus looks ok, get away with little damages. 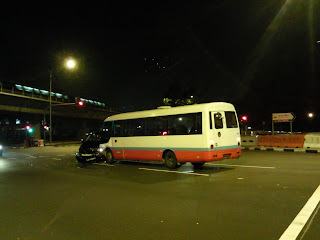 While at coffeshop last nite, my kopi -kaki Rajan who has been driving on Singapore roads for more than 12 years was relating to all of us that this particualr spot is one of the most notorious route in Jurong! 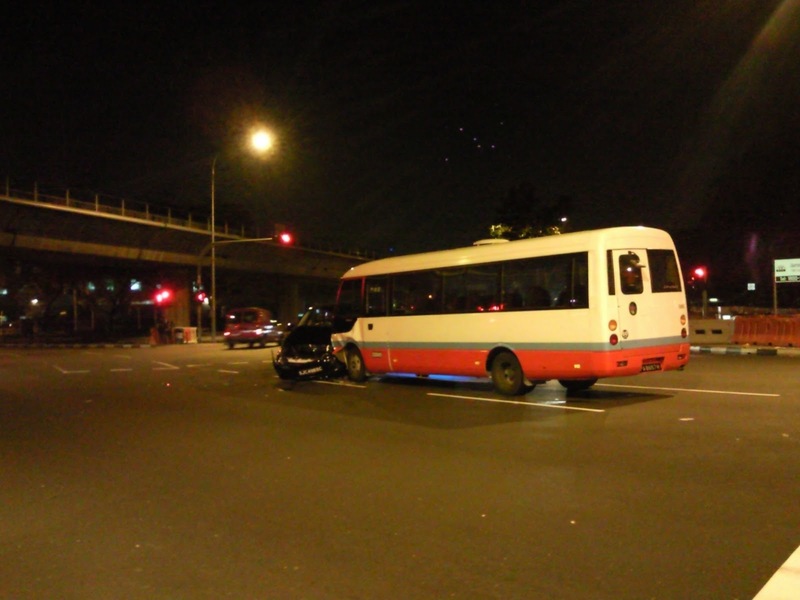 Many injuries and accidents occured at this junction, its not the first time he seen this. He was stucked in AYE two days ago in a 5 cars collisions accident. He also lamented that road users are not patient and many of them are either fiddling with their gadgets sms or calling on the mobile phones while driving. Hence nowadays when his wife or kakis call him, he can usually make the 'excuse' that he's on the wheels and driving , can't take our calls in order to avoid any possible accidents. hah ha maybe , some of us her can start thinking about this strategy when an angry customer or a ku-ku/mental friend start calling you. I personally felt what my friend Rajan said is true when I was cycling home from West Coast using this route 2 months back. Lorries, containers, trucks, all forms of cars , motorcyclists speeding along this Corporation Road, no mercy from them! They behaved as if they are rushing for their next meal or entering the next SG F1 GP race! I really hope all road users can display more patience and tolerant of each other. Is there a need to beat the traffic lights to save the 3mins or so? if you are observant, do you notice the plastic red, white barriers along these roads? yes, you are right! The LTA contractors are widening the roads bewteen Boon Lay Way and Corporation Road. They could be possible source of distraction and blocking views of motorists. Maybe the whole of Singapore is preparing for the 6.5million people mark . . .
Busy stretch of road to look out for!